With the sun finally making an appearance here in the UK, its time I start protecting my skin. I always forget to put SPF on my face almost daily in the Summer time and with my skin pretty very pale it burns so easily which is where these BB Creams come in. I always forget to put SPF on my face so having a BB Cream that will not only perfect my skin and make it look its best but will also protect my skin is a massive bonus. BB Creams are perfect for the summer as they are lightweight and give the coverage and appearance of foundation without adding too much to the skin. Most BB creams also have SPF, both of these two I have been testing have high SPF's which is great for the Summer months. BB Creams are technically tinted moisturisers so they will keep your skin hydrated throughout the day. They are perfect for normal to dry skin and focus on covering blemishes and discolouration. 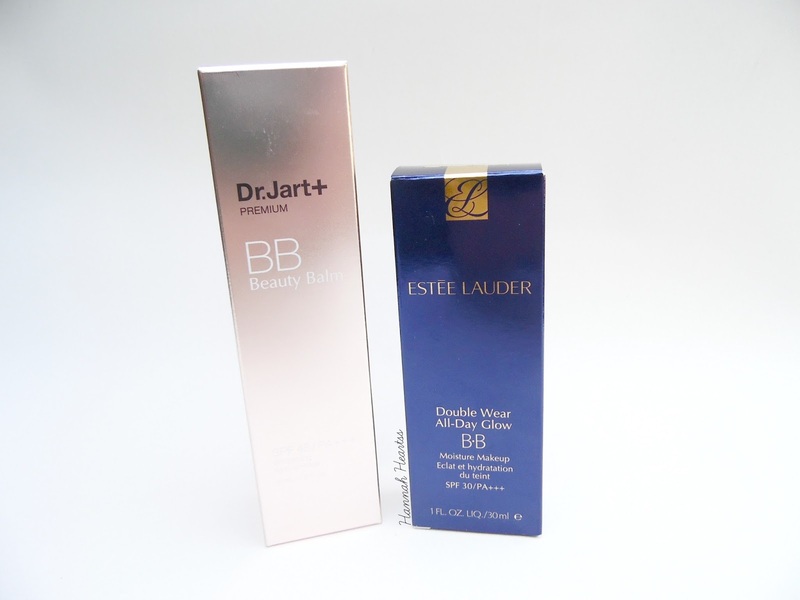 To apply both BB creams I used the same method as I would when I apply foundation. I apply the BB cream with my fingers to my face and then I use my Real Techniques Buffing Brush to blend it out. The Dr Jart+ BB Beauty Balm* is perfect for when I have fake tan on as it is a touch darker than my natural skin tone but I can get away with it when I am wearing not fake tan if I apply some down my neck. This BB cream has an great high SPF of 45 as well has having PA+++. It also claims to be anti-wrinkle and whitening. I really love the packaging on this for a start. It comes in a gorgeous black and light gold tube, in a unique shape, and has a pump which makes application so easy. This one has a very high coverage with a lightweight finish. Once applied in the morning it is still there when it comes to taking of my makeup in the evening. I have quite dry skin and this did help keep my skin hydrated and it also brightened up my skin. This BB cream is only available in one shade and retails for £31 - available here. The Estēe Lauder Double Wear All-Day Glow BB* has such a gorgeous coverage. The packaging is so luxurious with the light pink tube and rose gold accents - I do love a bit of rose gold. I went for the shade Intensity 1.0 and it is a perfect match for my pale skin. This one applies more like a foundation and is slightly thicker than the Dr Jart+ one. This one has lower SPF than the Dr Jart+ with SPF 30 and PA+++. 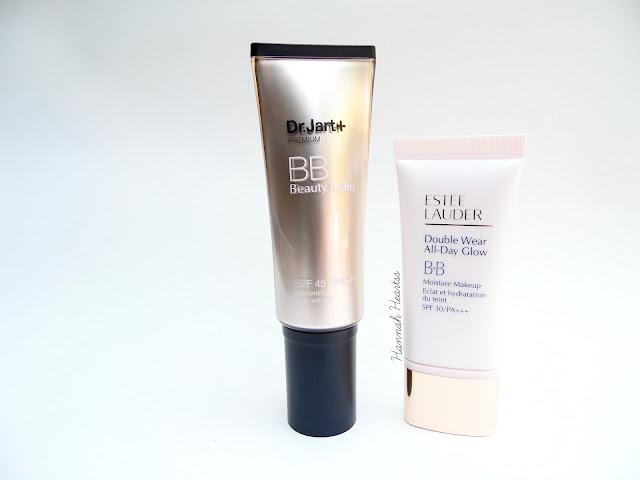 This BB cream has incredible coverage and lasting power. I wore this to Summer Time Ball on Saturday and it lasted all day, didn't melt off or cake! I noticed that each time I applied it, it gave me skin a slight radiance and glow which I really enjoy because I normally go for a matte finish. 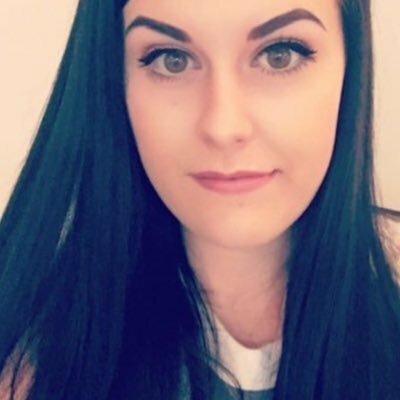 This BB cream retails for £28 - available here. The lovely people over at Cosme-De have given me a discount code for my UK based readers to enjoy! When you use the code HHEARTSS you will get 15% off and a sample of the SK-II Stempower. This code is only available for UK orders and isn't applicable best value or promotional products. This code is valid until the 30th of June 2015.